So far since the beginning of Coin Guides launch we’ve posted several wallet setup guides for beginners. We covered how to setup a wallet, creating an address, how to send and receive coins from your wallet. However we’ve not explained in depth features of a Cryptocurrency wallet. While there are several different types of wallet for Crypto currencies it is very essential that you first understand the basics of core wallet. 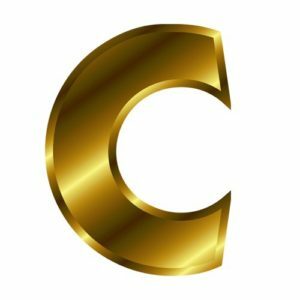 Here comes the ultimate beginners guide to core wallet. This guide covers wallet setup, wallet backup, encrypting wallet, exporting private keys, syncing, staking, debug window and much more. Also at the end of this article we’ll add some security tips to follow if you are holding your funds in core wallet. Whatever the wallet type is first of all you have to understand that the crypto coins which you hold are not stored in your wallet. They are stored in a public encrypted digital ledger called Blockchain. While the Banks store your funds on their private ledger; Cryptocurrencies store it in a distributed public ledger and that’s the beauty of crypto currencies. It is decentralized and you are the bank. The private keys is what gives access to the funds that’s stored on a public address. If you lose them you lose all your funds and always remember that if you don’t own the private keys you down own the funds your wallet holds. With core wallet you own your private keys and so you have full control of your funds. For any crypto currencies there will definitely be a core wallet. For Bitcoin use can find the Bitcoin Core wallet, for Dash you can find Dash Core wallet and for Litecoin here is the Litecoin core wallet. Core wallet is the official wallet for any given crypto currency and its recommended by most. What is QT and QT wallet? QT is an UI framework and a cross platform application for developers built using C++ programming language. It helps developers to easily create software applications. QT wallet – Most of the crypto currency core wallets are developed using QT software framework. They are available for Windows, Linux and Mac. QT wallets are professional client and offers full function that’s available for a currency. Also they are heavy as it is known to download the complete blockchain to your local computer. 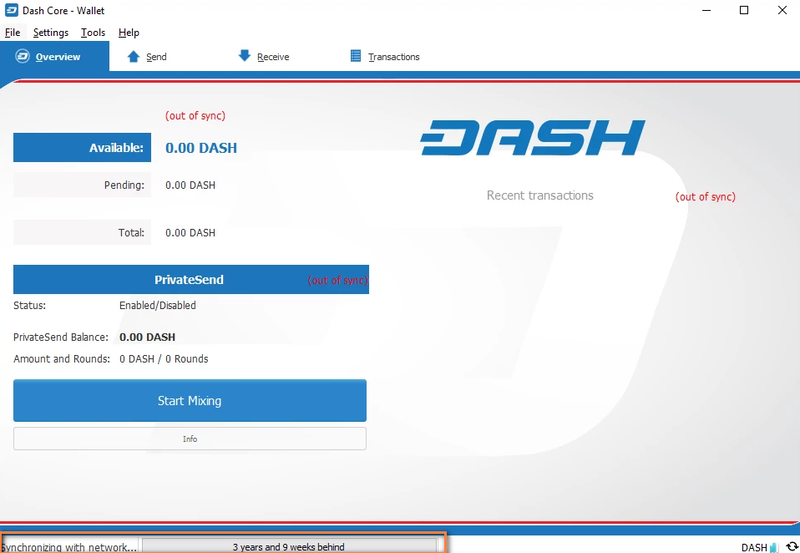 Before explaining all these features we’ll give an quick introduction on wallet setup first and for this we’ll use Dash Core wallet as an example. 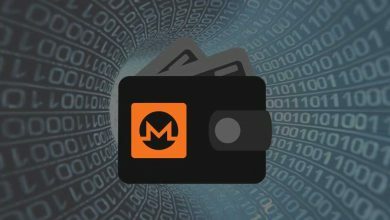 Note that this wallet guide and explanation applies to Bitcoin, Litecoin and almost any Altcoins core wallets. To setup the wallet first we’ll need to download the client from the official website. The official download links for a coin can always be found on Bitcoin talk announcement page or on the official website. 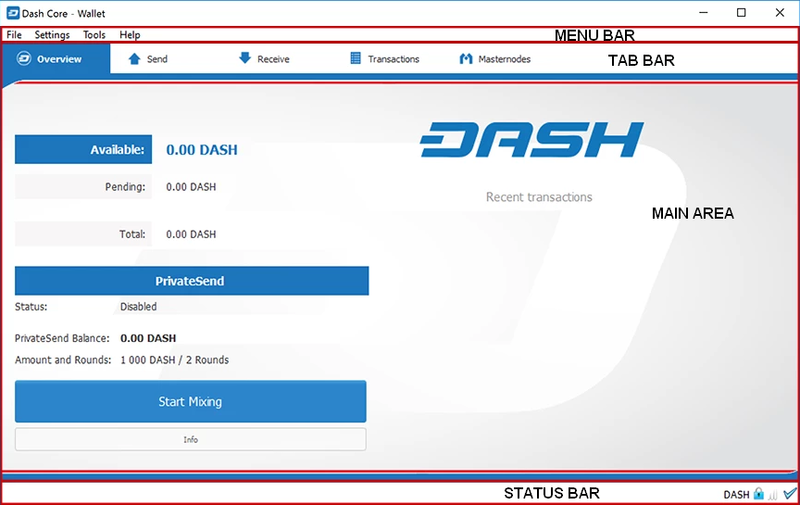 Step 1: Go to Dash Website and download the wallet client. 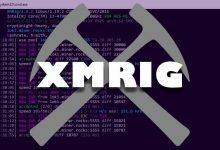 Its available for Windows, Mac as well as Linux. However in this guide we’ll walk you through Windows. Step 2: Once downloaded, run the setup file. Now your Windows or Antivirus may block the program. Its false positive so add exclusion and run the program anyway. Step 3: The setup Wizard is self explanatory and it’s easy to grasp. Choose the file path and follow the on screen instructions to complete the wallet setup. 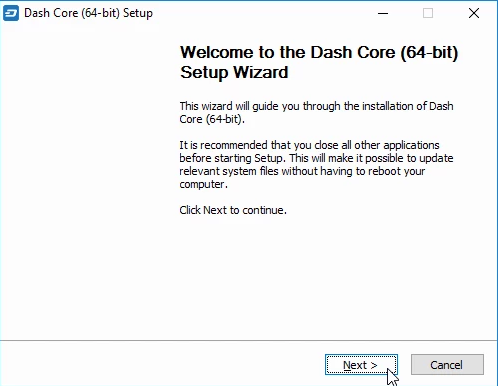 Step 4: Once the Dash wallet is installed you can run the client. Upon running the client for the first time it will ask you to choose a file location where you wish to store the core data files such as blockchain data and wallet. Since the blockchain files are huge and it grows over time you should always choose the directory that has enough space. 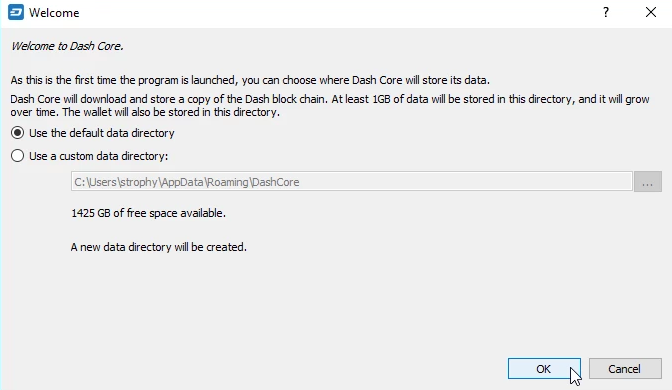 Note that most of the core wallet these days gives an option to choose the data directory. There are still some coin wallets which automatically puts these core data files in C:/ drive. The path can be found at: C:\Users\username\AppData\Roaming. Step 5: Once the above step is done it should load the wallet and start synchronizing with the network. 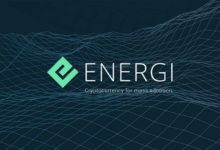 It downloads the complete blockchain to the drive which you previously choose. It downloads huge data so make sure you have enough bandwidth. Depending on your broadband speed it may take a lot of time to completely sync with the network. You can find the sync process at the bottom of the wallet client which is the wallet status bar. If it takes too long to synchronize then you can download the blockchain directly which can be found on the official website. Once it is completely synchronized you will see the tick mark at the bottom right corner along with the network signal. Your wallet is ready when you see that tick mark. It means that your wallet is completely setup and synced up to date with the blockchain. You can start sending and receiving funds now. If you look at your wallet main window you’ll find menu bar, tab bar, main area and status bar. Not just in Dash wallet, most of the crypto currency core wallets have the similar elements and design. In menu bar you’ll find file, settings, tools and help. Under file menu you’ll find backup option, sign message and addresses. Under settings you’ll find an option to encrypt wallet and other general wallet settings. Under tools you’ll find network information, debug console and other configuration settings. In help menu you can find the wallet version and other legal information. Depending on the wallet design and coin specifications you’ll find the following elements in the tab bar. 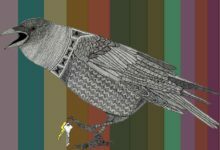 The above image is from Denarius Core wallet. Overview tab shows your wallet balance and transaction details. Send Coins tab is used to send coins to another address. 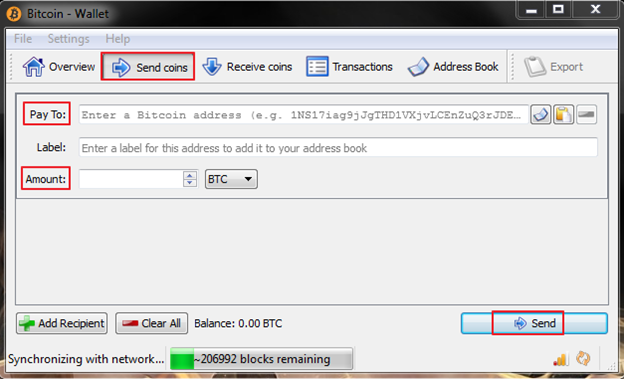 Receive Coins tab is where you can create a new wallet address or set a label to the address. It generates a new address along with the QR code. Transactions tab shows the complete list of transaction that your wallet processed just like your Bank statement. Address book is where you can store the list of wallet address just like your phone address book. This helps you to choose the address when you are often doing transactions. First things first. Once your wallet is ready the very first thing which you must do is to encrypt your wallet. By doing this you are adding an additional layer of protection to your wallet. 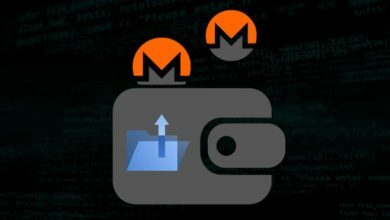 You can encrypt all coin wallets and the wallet encryption option can be found under settings. Encrypting your wallet is very easy however you have to be very careful while encrypting. First choose a strong passphrase of ten or more random characters or eight or more words. Make sure to remember the password or store it in someplace safe. It should be very strong as to no one can ever guess or break it. Go ahead and encrypt once only when you are confident with your passphrase. Note that if you encrypt your wallet and forget the passphrase you’ll lose all of your coins. Once your wallet is encrypted you should see a lock sign at the bottom corner of your wallet. Also whenever you wish to send funds you’ll be asked to enter this password. After encryption its backup. Whenever you create a new receiving address make sure to backup your wallet. Creating a wallet backup is very simple and on most wallets it can usually be found under file or settings. Create a name for backup, choose the location where you wish to save this backup and click on save. It will save as wallet.dat file. 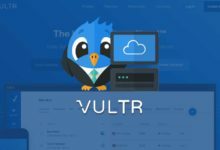 In case if your hard drive gets corrupt you can import this wallet.dat file to another computer and restore your funds. This is the third most important thing which you should take note on. At the beginning of this guide we informed you that if you don’t own the private keys of your wallet address then you don’t own the funds that it holds. 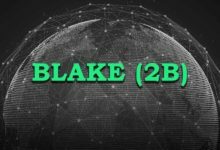 Private keys gives access to public address in blockchain. Whenever you create a new wallet address (public address), a private key for the address is also generated. However for security reasons private keys are not displayed by your core wallet. You’ll have to export them using your wallet console. Your may or may not have created several addresses. Remember that each and every public address holds a separate private key. 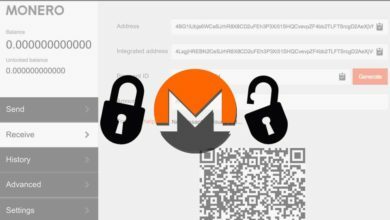 If you hold coins in multiple address then it’s important that you are exporting the private keys of each and every address. 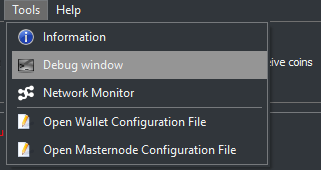 Step 1: In your wallet go to Tools >> and open Debug Window. Step 2: Now in Debug window go to console tab. It should return private keys of the address, however it won’t work if you have encrypted your wallet already. The passphrase should be within the quote and 100 is the maximum seconds for the wallet to stay unlocked. Once 100 second passes it will lock the wallet automatically. You can change 100 to anything you like. Step 5: Once unlocked follow the step 3 to export the private keys. Step 6: Important: Once you copied your private keys in the same console window type walletlock which will lock the wallet. Also remember to clear your clipboard history. Store your private keys somewhere safe. It comes in handy when you forget your wallet passphrase or password. In console window type help and enter. 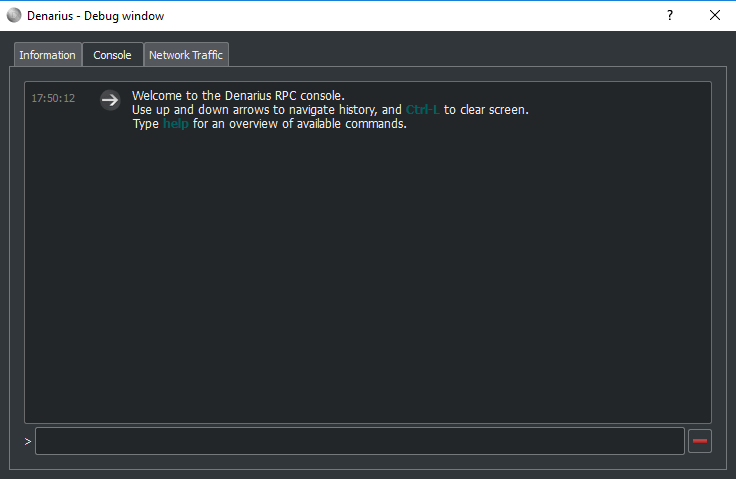 It will return an overview of all available commands which you can use in your wallet console. Under settings you’ll find wallet options which can be seen on all crypto currency wallets. It is self explanatory and there you’ll find some general wallet configuration settings. 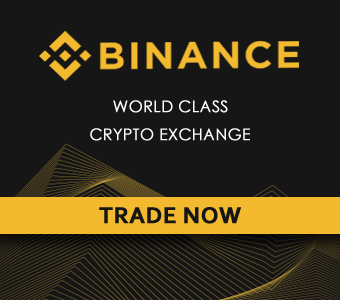 This feature can only be found on proof of stake and masternode coins. Staking simply means storing coins in your wallet. 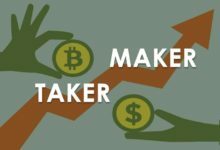 To stake; the coins needs to be mature enough. Once the coins are mature just keep the wallet open 24 x 7, it starts staking and generates some return depending on the coin specs. Recently we shared Honey wallet setup guide which is a stackable coin. Using your wallet your can sign message your address. We have a guide on how to sign message your Bitcoin Address. There are some coins that offer private send, dark send and instant send feature which we’ll explain in a separate post. 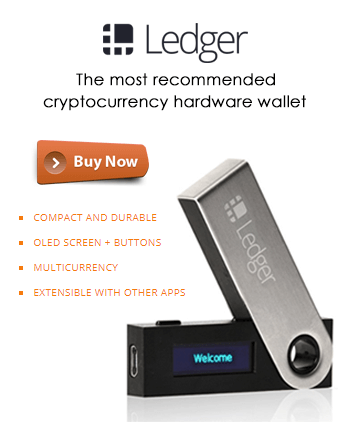 When it comes to security; offline hardware wallets like Trezor and Ledger Nano s are a step ahead than desktop core wallets. If you are holding large amount of Bitcoins or Crypto assets then we suggest you to get yourself a hardware wallet to protect your funds. It doesn’t mean that desktop wallets are weak in terms of security and privacy. Since most of the time the core wallets are connected to the internet they are prone to more attacks than hardware wallets. However if you follow these safety measures then you can ultimately protect your wallet from hackers. Take a backup of your wallet and put it in a cold storage. For example external hard drive or pen drives which is not connected to the internet. Always encrypt your wallet beforehand and never store the encryption seed on your computer. 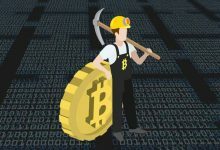 Never ever setup your wallet on mining rigs or public computer. Keep the wallet in your personal computer. Additional online wallet security tip: If you are using an online wallet or holding funds in exchanges then it is recommended that you add Google 2 Factor Authenticator. We hope this guide has enough explanation for any beginner to understand the fundamentals of crypto currency wallet. This wallet instruction not only applies to Bitcoin wallet, Dash wallet and Litecoin wallet. Most of the Altcoins are based on Bitcoin technology so the functionalities and features explained here applies to all core wallets. If you found this guide helpful then please do share it so new comers to the crypto wallet can understand. 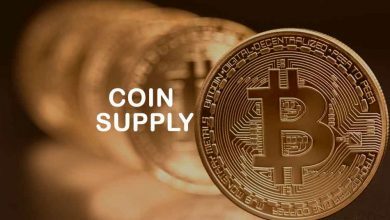 To get more updates from Coin Guides follow us on Twitter and Facebook.